I just finished re-reading Dune again and had to get this off my chest. Please note: I have never read beyond a couple of chapters into the sequels of Dune and have no real interest in reading further. Everything that follows limits itself exclusively to the original 1965 novel. Besides the Bible and a select number of the Church Fathers, there are very few books that I actually bother to read more than once. Ironically, one of those is Frank Herbert’s Dune. Christianity is nowhere to be found except as part of a synchronistic pseudo-religion concocted by those in power to control the masses. Christ explicitly declares that He will be with us always and that not even the gates Hades will be able to overcome His Church. So, any science fiction or speculative fiction that eradicates Christianity usually falls outside my ability to suspend my disbelief. All religions are enough alike that in the face of billions of lives lost they could suddenly find a means to unite under one watered-down version of themselves. Christ specifically says: And this is eternal life, that they know You the only true God, and Jesus Christ whom You have sent (John 17:3). There is no way to water that down. It is well written and entertaining. The world-building Herbert pulls off is breathtaking. For an author that (at least within the pages of his book) denies the divine, he is brutally honest about what a world looks like without God. It is this last point that I find most interesting about Dune and was what really lept off the page when I most recently read the book again. Unlike all of the various adaptations of Dune (there are three that I am aware of), the books end with Paul failing. A most efficient Mental, Piter, wouldn’t you say, Feyd?…But he consumes too much spice, eats it like candy. Look at his eyes! He might’ve come directly from the Arrakeen labor pool. Efficient Piter, but he still can err…This is a Mental, Feyd. It has been trained and conditioned to perform certain duties. The fact that it’s encased in a human body, however, must not be overlooked. A serious drawback, that I sometimes think the ancients with their thinking machines had the right idea. The society in Dune abandoned “thinking machines” in favor of honing the human form to the best of its ability through genetic breeding programs (Bene Gesserit), the use of Spice (Space Guild and Mentats) and training (Sarkurkar and Fremen). The stated goal of all of this was power. Baron Harkonnen, though a despicable human being, was absolutely correct: no matter how much human beings try to control themselves and their environment, they are still human beings and will err. There are things that will always be out of our control. This is wonderfully expressed by Paul’s angry warning to the Reverend Mother Gaius Helen Mohiam, “Here I stand…but…I…will…never…do…[your]…bidding!” He is referring to the fact the he is the culmination of the Bene Gesserit breeding program, the Kwisatz Haderach, which they sought to control. When Paul first discovers the truth about Himself, when the Spice of Arrakis begins to change him, he begins to see how various choices affected possible timelines. This prescience allowed him to see a future he desperately wanted to avoid: a jihad by the Fremen in his name that would embroil the entire universe. He spends the rest of the book trying to figure out a way to avoid this jihad. Paul saw how futile were any efforts of his to change any smallest bit of this. He had thought to oppose the jihad within himself, but the jihad would be. His legions would rage out from Arrakis even without him. The race of humans had felt its own dormancy, sensed itself grown stale and knew now only the need to experience turmoil in which the genes would mingle and the strong new mixtures survive. The vanguard of this strength would be the Fremen, a people dominated by the Darwinian code of the survival of the fittest. Tempered in the harsh, water-starved planet of Arrakis and shaped by the Spice they would take that strength, mingle it with humanity across the universe in a bloodbath that would cull the weak. As I said, brutally honest. Without God all we have is death. By the billions. This all re-enforces my own Christian faith. The same race-consciousness that Herbert hints at in the pages of Dune is embraced in toto by Christ when He becomes incarnate. The transformative power that the Bene Gesserit, Space Guild and the Jihad grasp at is freely given in Christ. The mechanism for transformative change is wrested from the hands of death by the resurrected Christ and becomes not just life but eternal life. Ever since I started down the path of trying to combine Holmes and Cook, I have been trying to create a megadungeon that would tick off all the boxes I see suggested in a Holmes-style game. To a certain extent, I have accomplished much of what I wanted with my version of the Chateau des Faussesflammes, but the result has been, well, really complex. 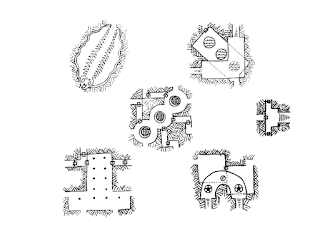 As my Gamer ADD has recently returned to Holmes, I have been working on taking some of the ideas I put into practice with the Chateau, but in a much simpler format in order to flesh out the Sample Dungeon found in Holmes. 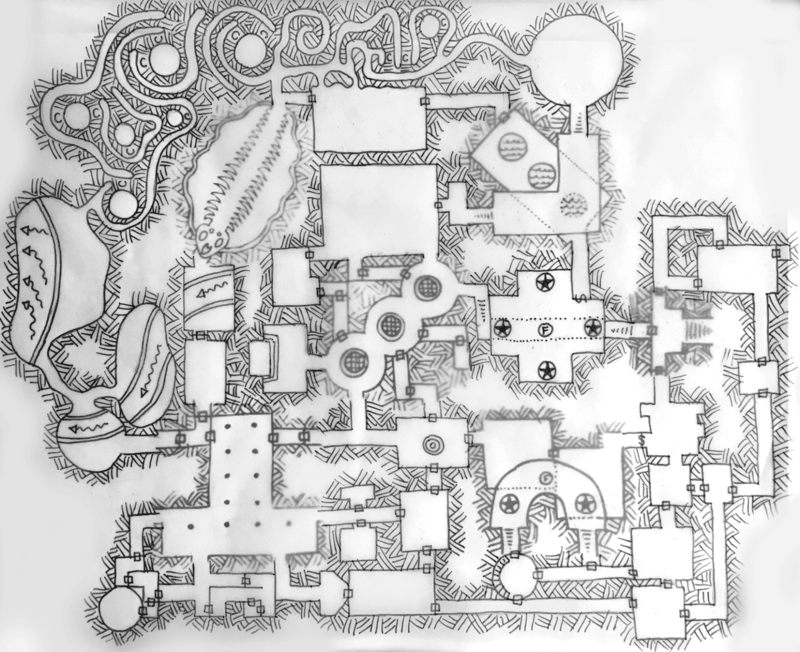 Here is the basic concept: The dungeon beneath Portown is part of the Mythic Underground. Therefore, it is an NPC unto itself. One of the great dangers of the Mythic Underground is that as an environment, it is hostile to adventurers (as is evidenced by the fact that doors easily open for monsters, but PCs must use Thief Skills, spells or Strength). One way that hostility can express itself is by actually changing. The idea here is that the spaces around these six elements can change on a whim. 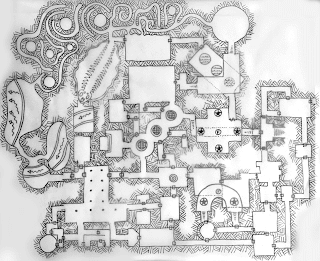 For my part, I am imagining various factions vying for control of the dungeon. Each faction controls a different version of the dungeon. As each faction's power waxes and wanes, the Mythic Underground exposes different versions of itself to the surface world. 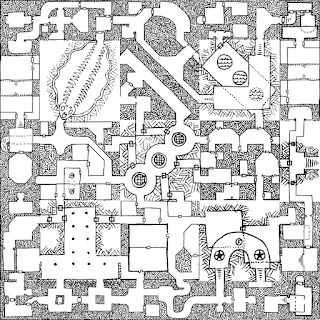 The result is an ever-changing megadungeon with an unlimited number of rooms; however, PCs will always have anchor points of familiarity if they can find those unchanging elements of each version of the dungeon. 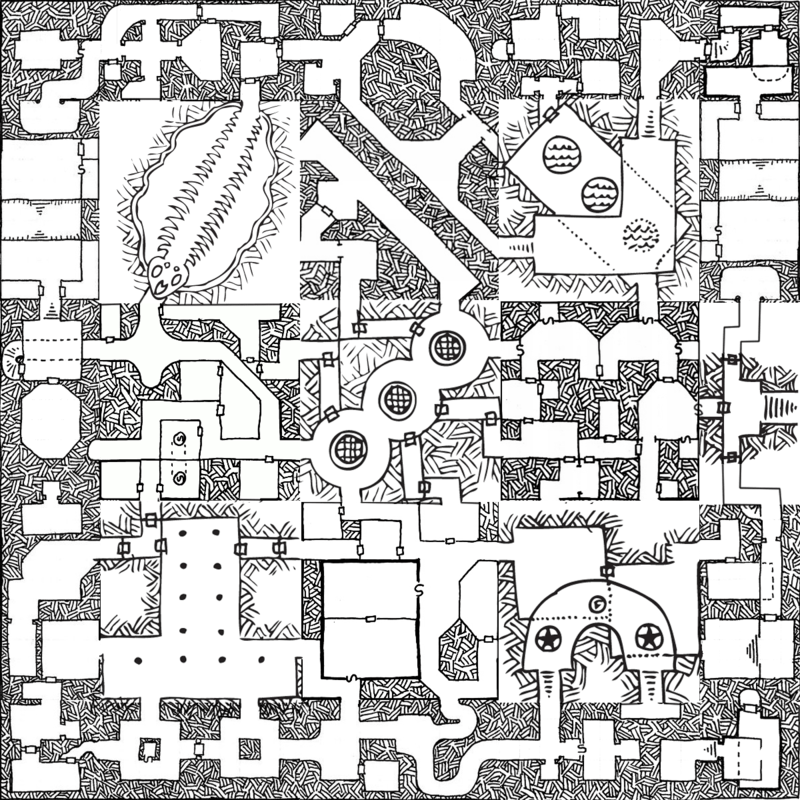 If they can figure out part of the mechanism of when the dungeon changes, they can also begin to have some control over which version of the dungeon they explore. Recently, an old high school buddy of mine got inspired to go back and re-read some of the older rulesets of D&D, in part because of my gushing review of the Swords & Wizardry Legion stuff I was able to get my grubby mitts on. "When being attacked by gnolls, bugbears, ogres, trolls, ogre magi, giants AND/OR TITANS (emphasis mine), gnome characters subtract 4 from their opponents' "to hit" dice rolls because of the gnomes' small size AND THEIR COMBAT SKILL AGAINST THESE MUCH BIGGER CREATURES (mine, again). He also challenged me to figure out why a gnome would have combat skills against titans. So, although gnomes are ineffectual at doing any damage to these types of creatures, from a tactical point of view, they do serve as a great way of slowing them down long enough to get stronger units in place to take the larger creatures out. Titans primarily live on other planes, but do occasionally visit the Prime Material Plane especially to mingle with Storm Giants. Titans can use Invisibility at will and have access to a number of spells from both the magic-user and cleric spell lists. Titans who use Protection from Evil get double the bonus against Lawful Evil creatures. This paints a picture of a creature type that existed before there was a distinction between Arcane and Divine magic, who does not see other planes as their natural home, spent time specifically fighting Lawful Evil creatures but lost due to the fact the the Prime Material Plane is no longer their normal habitat. There are two groups of creatures that immediately suggest themselves when one thinks of Lawful Evil: Humanoids and Devils. Only one of those groups lives on the Prime Material Plane. I am now going to go down a path that necessitates an understanding of my reading of the relationship between various humanoids and Dwarves. You can find that post here. The ancient being(s) that twisted elves and dwarves into various humanoids did so in an ongoing battle with Titans on the Prime Material Plane. In response, the Titans developed more powerful protection spells against the humanoids which made up the bulk of the armies they were fighting against. In response, the ancient(s) enslaved the dwarves to use as fodder against the titans and further twisted the dwarves into gnomes. Dwarves and gnomes are resistant to magic and gnomes are bread specifically to deal with illusionist magics (to fight invisible titans). Due to the fact that the protective magics of the titans were designed to fight Lawful Evil humanoids, when they came upon dwarves and gnomes, they were caught by surprise and underestimated the danger of their foes. As a consequence, the titans were driven off the prime material plane. Thus, dwarves and gnomes have combat skills against titans because they were specifically bred to fight against them by the ancient(s) who twisted elves and dwarves in the first place. The Venerable Barlaam the Abbot of Khutyn, Novgorod is an ascetic saint of the twelfth century. He grew up in an illustrious family of Novgorod, but chose the monastic tonsure early in life. 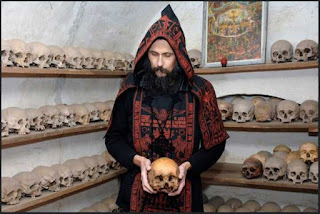 He became a hermit, living in the wilderness of Khutyn outside the city. He was a strict ascetic and by the end of his life, an entire monastic community had developed around him. 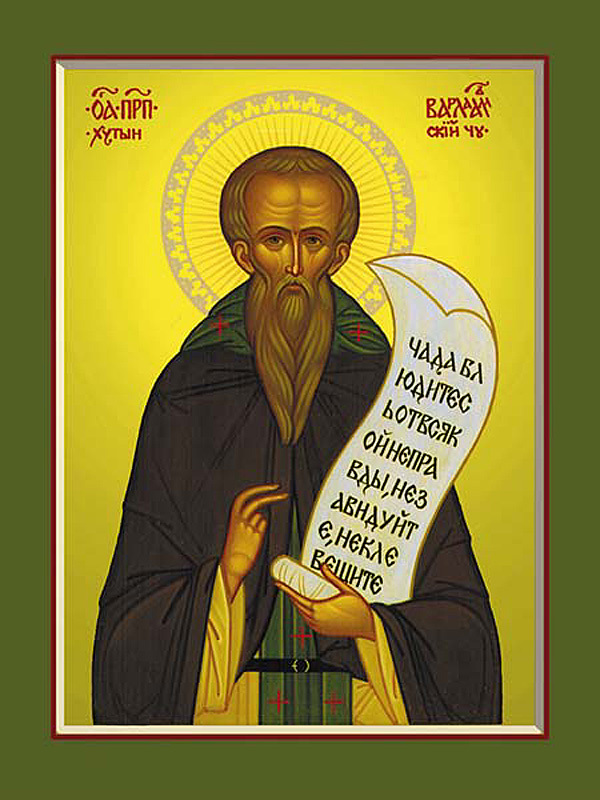 Today, however, is not the Feast of the Venerable Barlaam of Khutin, that would be November 6th. Today is the Nativity of St. John the Baptist, which I have already mused upon here. In the Orthodox Church, we fast in preparation for various feasts. Right now, we are in the Apostles’ Fast getting ready for the Feast of Sts. Peter and Paul on June 29th. 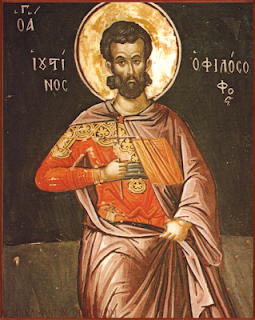 I chose to write about St. Barlaam because in Slavonic practice, he holds a special place of honor during times of fasting. As an exemplar of the ascetic life, he is especially called upon during times like these to pray for the strength we need to keep the fast. Clerics: May either gain one automatic Turn success or an automatic maximum roll for one healing spell. Fighters: May either gain one automatic hit in combat or one automatic maximum roll for damage. Magic-users: May either gain one automatic Saving Throw success or an automatic maximum effect for one spell. Thieves: May either gain one automatic Saving Throw or an automatic success on one attempt at a Thieving Skill (which could be interpreted as maximum damage on a backstab). If the fasting in question coincides with the preparation of a major feast, the character gets two uses of the above bonus. I love me some random tables and I love me some Holmes Basic D&D. In honor of Free RPG Day, Zenopus Archives released Holmes Ref 2.0. I highly recommend checking it out, even if you have no real interest in Holmes because it is chuck full of goodness, especially of the random nature. Ostensibly, it is a reference sheet for taking Holmes beyond its original scope of character levels 1-3 using OD&D as its default point of departure for higher levels (brilliant idea, especially since that is exactly what Holmes himself did). Thus, I find myself desperately wanting to play a Holmes campaign using this stuff. There are, however, some very cool variations in here that are portable to any Old-School game and, with a little work, to any version of the game. Secondly, it provides a Backgrounds table for human characters that players may roll on in lieu of rolling up beginning cash. Each background provides a cool ability, a set of equipment appropriate for that background and a reduced number of dice x10 for starting cash. So, for Sho Zo-ton from Afar I rolled up a Nomad background which provides an ability to surprise 1-4 on a d6 when outside while wearing leather armor or less and the ability to use archery while riding. In addition to 1d6x10 starting gold (I rolled a ‘4’), the character starts with a Light Horse, Lance, Horse Bow and Leather Armor. This is where the fun begins. The title “from Afar” suggests that this character comes from a distant land. A fantasy version of Korea immediately suggested itself, because traditionally Koreans have 3 syllable names: the first being the family name and the last two being the given name. Therefore ‘Sho’ is the character’s clan and ‘Zo-ton’ is the given name. Additionally, traditional Korean weapons fall into three broad categories: bows (which are considered to be THE Korean weapon), spears (of which a lance is a variation) and sword. Traditionally, men of the Joseon period (14th c.-19th c. which is approximate to the suggested fantasy Western culture in most D&D settings) wore their hair in a sangtu top-knot. This signified manhood which came from being married (and they married young). This suggests a reason why Sho Zo-ton came from Afar to adventure in the “West:” his family, specifically his wife, was killed by strange beasts (orcs? gnolls? lizard men?) that he learned originated from the area that the campaign takes place. He is here for honor and vengeance. All this from a couple of random table rolls! Firstly, it provides a customizable Wandering Monster Table in that the monsters are grouped together by Hit Dice and the reference numbers are organized into groups of twelve allowing the GM to roll up to a d8 in addition to a d12 to get a random monster. The smaller the first die, the lower the likely HD of the monster. Secondly, it provides a cool way to create new monsters. The Table is organized into AC, DMGxAT, AC, MV, AL, TT, Special Characteristic and Habits. Roll on the table using the aforementioned d8 and d12 to randomly determine each category. With a little imagination, the result is a brand new monster (and one I am guessing that pushes our creativity beyond what we would normally do). These strange plants were magically grown by the ancients to warn of intruders and discourage interlopers. They appear to be doors made of wood without any handle. Carved in the middle of the door is an abstract face with a open mouth as if screaming. Within 1d3 rounds of there either being light within 30’ or movement within 10’ the living door begins to shriek and shoot thorn-like darts out of its mouth. Any attack against the living door that doesn’t target the face does no damage. The dart attacks and the shrieking will cease (or never begin if done quickly enough) if the proper type of food (e.g. Carrion Crawler flesh), determined by the ancient who grew the creature, is placed inside the mouth of the Living Door. The mouth will close and the door will open and remain open for 1d6 turns while the food is digested. Once killed, a Living Door functions as a normal locked door; however, it is rumored that if food is placed inside the mouth of a dead Living Door it can be revived to then accept whatever food is placed in the mouth to revive it. A very Holmsian monster, if I do say so myself! BTW if you are interested in seeing some good and inspiring movies that feature Korean archery, I suggest The Fatal Encounter and War of the Arrows. Today is the Feast of St. Botolph, Abbot of the Monastery Icanhoh who is a British saint from the 7th century. Born in Britain, he became a monk in Gaul. King Ethelmund of East Anglia sent his sisters to Gaul to learn the monastic discipline. There they met St. Botolph and learned that he wanted to return to Britain. Therefore, they requested that their brother bequeath some land to the monk so that he could build a monastery. 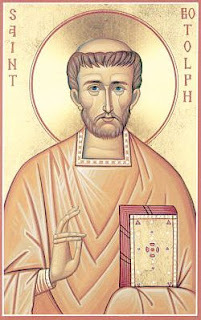 St. Botolph asked that whatever land was given to him did not come from any man’s possession so to avoid gaining from someone’s loss. Therefore, King Ethelmund granted the monk a piece of wilderness called Icanhoh. The place, according to his hagiography, was crawling with demons. Thus, before he began establishing his monastery, he had to fight with the demons and drive them all off. He spent the rest of his life in prayer becoming known for working miracles and speaking prophecy. After a bout with a painful disease in the last several years of his life, he passed in A.D. 680. HIs relics were found later to give off a sweet fragrance and to be incorrupt. 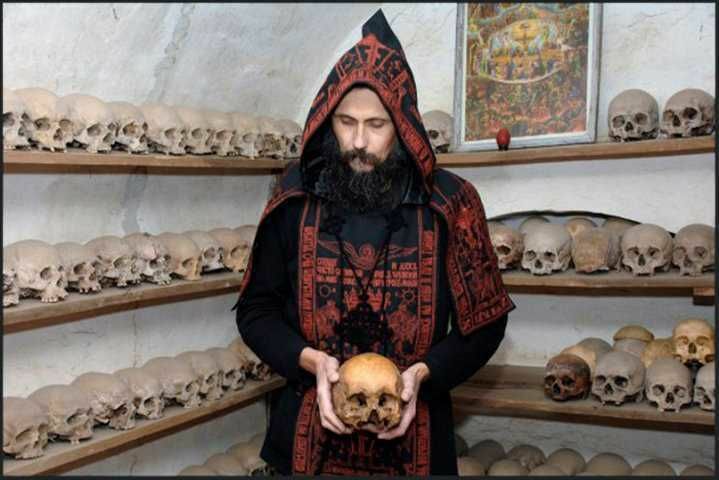 I have often pointed out the fact that the lives of the monastic saints closely resemble that of the typical D&D campaign. They come from Christian Civilization, go out into the Demonic Wilderness and tame it so that Civilization can expand; however, I don’t recall ever reading a saint’s life that so explicitly followed this formula. The hagiography literally says that Icanhoh was a desolate place where he had to fight demons. This is yet another example of why I think the formula of Christian Civilization vs. the Demonic Wilderness in D&D works so well, because it mirrors the experience of the Church Herself. In addition, it is really cool to know that the etymology of my old stomping ground suggests that not only is Boston Bean Town but also St. Botolph’s Town. It is too bad that the only Church of St. Botolph I know of is in Boston, Lincolnshire. Boston, Mass should have something dedicated to their namesake. This legendary +1 short sword/long knife was forged from the strange red metal recovered from a meteor. It was forged to be a holy weapon using incense as its carbon source, etched with a holy symbol and quenched in holy oil. In the hands of a Lawful character, it offers Protection from Evil 10’r when wielded. Against Chaotic creatures it is a +2 weapon and against the undead it is +3. Its original owner was the King’s Champion Dreux who had it forged specifically to combat a demon that had began to terrorize the people in the borderlands. Unfortunately, the demon prevailed and the Red Seax became part of the demon’s growing treasure trove. 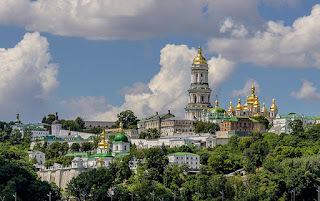 As the Kingdom’s fortunes fell with the increasing influence of the demon, the king’s youngest son, Merovech, gave up his monastic training to quest after the sword. He managed to sneak into the demon’s lair and steal the sword right out from beneath the creature’s nose. He went on to use the weapon to fight against and finally rid the kingdom of the demon’s influence, although he did die from the wounds he sustained before managing to deliver the killing blow to the demon itself. In honor of his great deeds, the Red Seax remains in the prince’s tomb where it awaits to be used once again to defend the realm against evil. For those interested, I used random tables here and here to come up with the properties and the background of the sword. When I was a wee high-school baby, I was introduced through some of my older friends to a cigarette smoking college student who wanted to start running a D&D campaign. The premise was simple. He showed us a map of where our characters were and asked us what we wanted to do. I remember how eye-opening it was to be at the steering wheel of the campaign: “You mean this whole campaign can be about us trying to hunt down and kill that blue dragon you told us about!? YES!” And, indeed that was the entirety of the campaign. It was also the first and last time I played a Chaotic Evil character. While I remember the campaign fondly, I do not remember my fellow players that way. Since all the players knew my character was Chaotic Evil (and therefore a threat, although what kind of danger they expected out of a 1st level Illusionist, I don’t know) and therefore they were always trying to kill my character. The DM, however, always had my back. Even when I blatantly explained how my actions were rather Chaotic and Evil, he always made the players explain to him how their characters would know. When they failed (because I was VERY careful that my actions could be interpreted as helpful) the DM would disallow every attempt to kill me off. In other words, the DM did a really good job of being a DM. He gave us a bunch of freedom to do whatever we wanted within his world, but very strictly enforced parameters around that freedom. There were certain things that were just not going to happen (like using player knowledge to screw with other players at the table). This actually made the freedom we had as players more valuable. For example, I knew I could get away with certain CE-like acts because the DM made sure that players couldn’t abuse their player knowledge and, in a way, I think he enjoyed how much I toed the line so that being CE never actually overtly hurt the party. Like many players in the 90s I played a lot of White Wolf products, and believe it or not I really appreciated these games. They actually taught me a lot about how to play a game. When my friends approached me about playing Vampire for the first time, for some odd reason they wanted me to be the…was it Storyteller? is that what they called the Referee/DM/GM? The reason I say odd, is because I rarely sat in the DM’s chair when we played. In retrospect, it might have been the few times I ran Call of Cthulhu one-shots that inspired them to ask me to take the reigns of a horror-themed RPG. If I am honest, I rather didn’t waste a lot of time reading up on “how to play” essays littered throughout the industry. I learned by doing and this was the first real opportunity I had to put into practice what I had learned from my experience in Moment the First. I presented my players with a world: Boston. I informed them of that world through their various clans and then dropped a McGuffin into the whole mess where everybody wanted the McGuffin for different reasons. I then allowed my players to do what they wanted to do (within the parameters set by the game and by the setting). In many ways, it was one of the more thoroughly satisfying campaigns I have ever been a part of, because I was surprised every time we played. My players refused to be predictable and as a consequence, my world had to react in ways I never imagined. It all culminated in a rousing three-way battle in the middle of Cambridge which left the players catching their breath in disbelief that they had actually survived. The best part: one of the players decided that it was in the best interest of everybody that the McGuffin be destroyed. I remember the player asking me if he could talk to me in private, because he wasn’t really sure that what he wanted to do was allowed. When I said, “Sure, why not?” I saw in him myself when that cigarette smoking DM asked our party what we wanted do to. He suddenly realized how much power he had over his own character and the campaign. The reaction around the table when the McGuffin shattered to pieces was one of the best moments I have ever had at an RPG table. I wasn’t responsible for that reaction, but I set up the freedom and the parameters for its possibility. I have been trying to duplicate this atmosphere for my players ever since and every campaign has a moment just like this, where my world interacts with a group of players that have taken the reigns of the campaign to create something that I could never manufacture on my own, even if I tried. In another White Wolf campaign, the group I played with decided to give Mage a try. We all toiled over character creation and painstakingly crafted the characters we all thought we wanted to play. Then our Storyteller? Referee? did something rather surprising that we all found shockingly fun: once he had introduced the fundamentals of the campaign, he handed us our characters’ counter-parts in the Technocracy. I ended up with a chick in a wheelchair. At first we all were not very happy, but then as we started to play we all realized that playing these characters that we had nothing to do with the creation of was actually more fun than playing our actual characters. I had no time invested in this character at all so I seized upon some of the things I saw on the character sheet and began playing her personality to the hilt without any fear of having this character die or be harmed or of even being liked. Other players followed suit and we soon found ourselves clicking as party, playing off of each other and outdoing ourselves when we had those carefully crafted characters we spent so much time creating. We were actually disappointed when we had to go back to our own characters. Playing wheelchair chick made me realize that unfettered creativity isn’t all that creative. Left to our own devices, we human beings are kind of boring. When we start putting limiters on where we start with our creativity, whether those limits are playing a character we had nothing to do with creating, using random tables, rolling attributes in order, using only the Fiend Folio or Monster Manual II, using B/X or the original three LBBs as a starting point or whatever, the choices we make are going to surprise us and lead down paths we would never have thought of otherwise. This was yet another example of complete freedom within a set of strict parameters that just exploded with creativity and good fun. I have used random tables ever since. I will end with a bad experience. It was the first time I played D&D 3.5 with a DM that pretty much resembled the fellow in the video that started this mass spilling of virtual ink. Our party found ourselves in a time-crunch. We couldn’t retreat for fear of the evil we had uncovered getting away and becoming more powerful. So we pressed forward through the dungeon we were in despite not being prepared in the way 3.5 expects its players to be. When we got to the boss fight, it should have been a TPK. We couldn’t afford to retreat, but we couldn’t do damage at a rate that would allow us to survive the encounter. In fact, my character was completely incapable of doing any damage. I was out of spells and was only good as a meat shield. When the DM realized the situation, he started fudging die rolls and inexplicably changed tactics so that our party could actually start doing the kind of damage we needed to do in order to survive. I actually felt cheated. My character should have died and I was robbed of a(n in)glorious death. We missed an opportunity as a group to re-think our party make-up and the way in which we approached the campaign to start anew and having to deal with all of the consequences of our previous party’s failure. Instead, we were all slaves of the story. The campaign never really recovered for me, but the upside is that it created an opening for me to introduce this group of players to Labyrinth Lord and the Lost Colonies were born. Although I have been sore tempted to fudge a die roll now and then, I have done my best to keep myself honest by rolling all my dice in the open ever since. As a consequence, even when those die rolls have resulted in the death of a beloved character, I have never felt cheated. 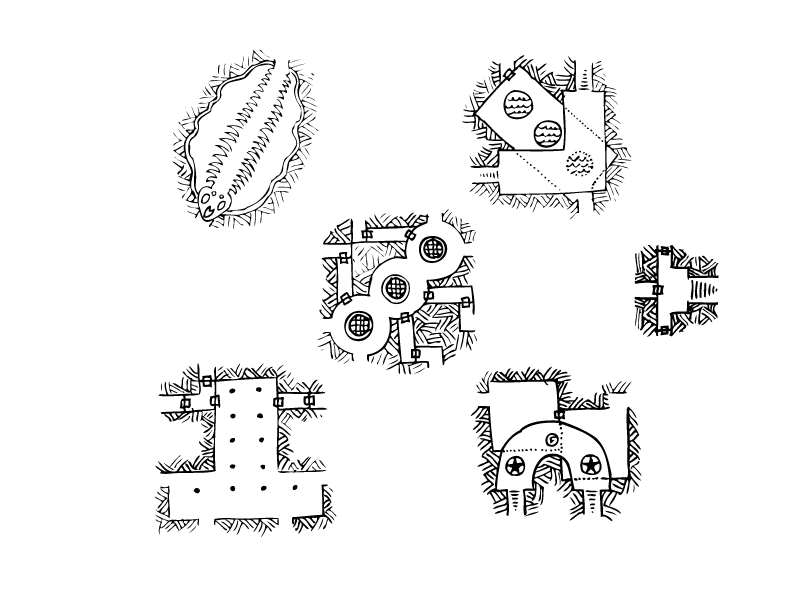 trope of an abandoned monastery with caves beneath? Don't you just want this guy in your campaign world? Interestingly, there is an example of a miracle performed through St. Silvans that looks an awful lot like a Hold Person spell. 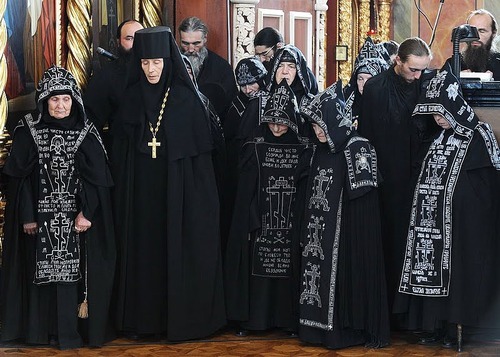 There was a group of robbers that had come to the monastery to do mischief. St. Silvans saw them sneaking through the garden and through his prayers they were held fast and unable to move. Only after they repented did the monk set them free. I see this as further evidence that the original Cleric Spell List was mostly inspired by Christian miracles. For those interested, here is the monk class re-imagined as a Western, Christian analog class for B/X and Labyrinth Lord. I use this as a class available to players in my Lost Colonies campaign. In Wilderness areas at the edge of Istenite Civilization is a militant order of monastics that is popularly known as the Red Monks, due to their use of a red wolf hook in their heraldry as well as their reddish-brown robes. Through ascetic practices of prayer and fasting, red monks seek to hone their bodies into living weapons to fight against evil in order to make The Wilderness safe for Civilization. At 1st level: A Red Monk is at +1 AC while able to freely move and wearing leather armor or lighter and are trained in Unarmed Fighting. They may use a 1d2-1/1d2-1/1d4-1 attack routine when not using a weapon. At 3rd level: A Red Monk’s Unarmed attack routine increases to 1d3-1/1d3-1/1d6-1. At 4th level: A Red Monk becomes immune to all forms of fear, including magical fear. At 5th level: A Red Monk’s Unarmed attack routine increases to 1d3-1/1d3-1/1d8-1. At 6th level: A Red Monk becomes immune to all forms of disease, including magical diseases. At 7th level: A Red Monk is at +2 AC while able to freely move and wearing leather armor or lighter. A Red Monk’s Unarmed attack routine increases to 1d4-1/1d4-1/1d8-1. At 8th level: A Red Monk becomes immune to all poisons, including magical poisons. At 9th level: A Red Monk’s Unarmed attack routine increases to 1d4-1/1d4-1/1d10-1. Red monks must have at least 13 in all prime requisites in order to get the +5% to experience. They must also have a STR and WIS of 16 to get the +10% bonus. Reaching 9th Level: A Red Monk may build a fortified church. So, multiple attacks don’t result in extra die-rolls, but rather in a bonus to-hit. Why not give advantage instead? Thus, the carrion crawler in JB’s example would get one attack, but would roll two dice and use the higher of the two. Since we are already going down this rabbit hole, shield-fighting should do the opposite. Rather than affecting AC, having a shield puts attackers at a disadvantage, meaning that they would roll two dice and take the lower of the two results. This advantage would be cancelled out by either multiple attacks or flanking. Two-handed weapons, therefore, should have advantage on damage rolls. This all leads to grappling, the bane of every D&D combat ruleset. The reason for this is rather simple: combat in D&D is very abstract, which is why multiple attacks can equal a bonus to-hit (two-weapon wielding in S&W) or an advantage as in my musings above. Grappling, by its very nature is . . . not. Thus, once anyone tries to go down the road of specificity and handle grappling it gets messy. Anyone can grapple. A successful attack roll indicates that grappling is taking place and both the attacker and target are now at a disadvantage. Thus, anyone attacking those currently grappling gets to roll two dice and chose the higher of the two and those grappling must now roll two dice and take the lower of the two if they wish to make an attack. This can only work on creatures that are larger than the attacker at the Referee’s discretion. This rule could also work for shield bashing, possibly even cancelling out the disadvantage the attacker gets for grappling because of the shield (though they would lose the defensive capabilities of the shield). I am currently play testing these ideas with a summer-time campaign with my kids. The first time it came into play was an encounter with a ghoul. Having shields made the encounter survivable and hammered the point that attacking with advantage and a paralyzing touch is just as nasty as three attacks per round with a paralyzing touch. I must admit, this is not the Feast of St. Alexis the Metropolitan of Moscow and Wonderworker of All Russia. HIs main feast is on February 12th and the Uncovering of his Relics is celebrated on May 20th (aka two weeks ago). I had been thinking of getting back into writing Saintly Saturdays because of St. Alexis, but life happened. So, today I will pretend I was on top of things and write a little about St. Alexis. By a little, I really mean a little because there are tons of stories I could tell but don’t have the time or space for so I want to actually tell the story of how I met St. Alexis because not only is the experience ripe for inspiration with RPGs but it is an experience that you can have yourself. I have spent a lot of time in hospitals the last several years having nothing to do but wait. So I searched far and wide for things that would not only pass the time, but do so in a way that would not sicken or depress me. One of the movies I found was call The Horde. Unlike so much of the stuff being made for American screens both big and small it is sympathetic to a Christian world view. The narrative is written primarily from the perspective of the Mongolians. The crisis is theirs, not St. Alexis’. Their solution to the problem involves summoning the Sorcerer of Moscow. While watching the movie, I didn’t realize it was a movie about an actual saint. It wasn’t until the movie was over that I went scrambling across the interwebs to find the life of St. Alexis and realized that this movie pulled a moment of his life to put on film. A rare thing and well worth your time. From an RPG perspective, it paints the cleric as a sorcerer and presents an alien and frightening world that St. Alexis must enter. I might add, that despite the weirdness of the world presented, the fundamental humanity of it all is never lost. There a ton of ideas and images to be lifted from this movie that can translate wonderfully into an RPG world. For example, just the image of the painted faces of some of the Mongols. How cool would it be to integrate that kind of face painting into a fantasy culture? So, see the movie. Encounter St. Alexis. Be inspired. It has been quite some time since I’ve regularly blogged about the saints and RPGs. Today is the Feast of St. Justin the Philosopher and he let me know that I should get back into the habit, at least once in awhile. As his moniker suggests, St. Justin was a philosopher, but he was unsatisfied with all of the various attempts by secular thinkers to explain life, the universe and everything. He kept trying this and that until he encountered an old man that told him he would find Truth in the Gospel. In Christianity, St. Justin found the philosophy he had always longed for. He opened a school in Rome, wrote two Apologetic Letters to the Roman Emperor defending Christianity among other works and was eventually martyred with several of his students in A.D. 165. Godly Justin great before the Lord, Peon the brave athlete, Valerion, and Chariton the wise, Charito, Evelpistus, and Hierax great of fame now have dyed in their very blood a bright and divine robe for the Sov'reign Lord of all; and being clad therewith, they all stand together rejoicing with the Angels’ hosts in the Heavens at the throne of Christ, the mighty King of all. My RPG mind reads this and envisions a verse from a bard’s tale about a mighty group of adventurers to inspire and embolden a group of mud-drenched soldiers or to entertain a tavern full of people drinking mead. And talk about some great names! Peon the Athlete, Valerian the Wise, Hierax the Great. Surely these inspire at least an NPC or two. Back in 2010, I wrote a post on Deities & Demi-Gods, which irked some folks because I took the position that it is good and right that the various pantheons of pagans gods and goddesses should have stats like monsters. I even have a Saintly Saturday post on St. Justin re-iterating that POV using St. Justin’s own words. When the chill of ignorance held sway over all creation because of the wanton spite of the foe, and the hoards of demons were adored and served as gods, then with willing and eager heart, O glorious Martyrs, you made chill deception cease through the most fervent heat of your burning zeal and divine faith, when you poured your blood out in longing for Him that poured out His Blood upon the Cross. Again, in my RPG mind this screams dark fantasy where city states ruled by demons and their cultists dominate the world and the PC heroes must grind away in hopes of bringing some dim light of hope to a world of shadows . . . I sense another bout of Gamer ADD coming on.